Onion | Infonet Biovision Home. Onion (Allium Cepa), a drawing of the whole plant,flower and bulb. (c) Courtesy EcoPort (http://www.ecoport.org): MEDIMPEX, Hungary. Thrips damage on onions. Note silvering and blotching of leaves. Purple blotch on onion. 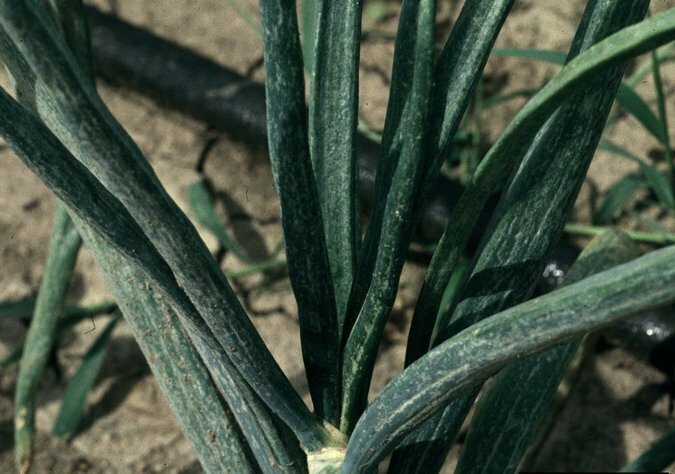 Leaf-tip dieback is a typical symptom of infection by Alternaria porri on onion. Close-up of advanced purple blotch spot. 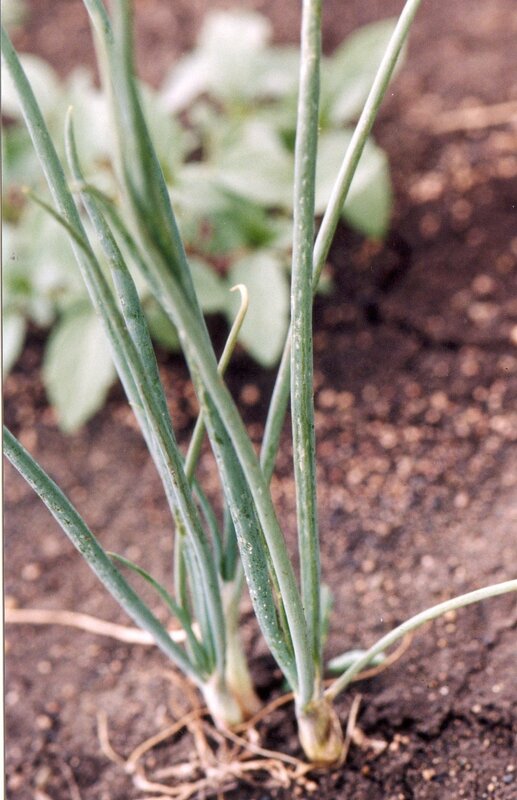 Thrips symptoms on onion - typical silvering and blotching of leaves. (c) Judith K. Brown. Reproduced from the Crop Protection Compedium, 2004 Edition. (c) CAB International, Wallingford, UK, 2004. 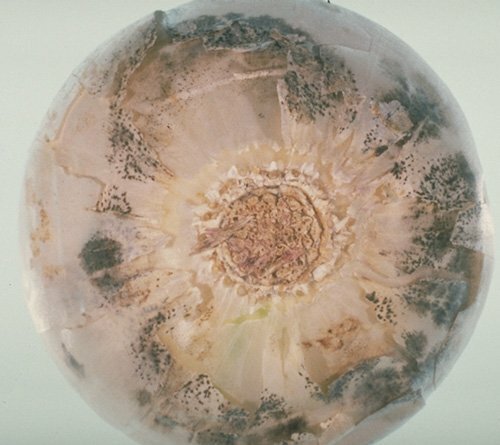 Sour skin (Pseudomonas cepacia) of onion. Onion is a biennial vegetable grown in temperate zones as an annual. In the tropics the varieties that do well are in effect annuals as they can produce seed within the first year of growing. Nutrient-wise 100 g of onion provides about 30 g calcium, 0.5 mg of iron, vitamin B, 0.2 mg of riboflavin, 0.3 mg nicotinamide, and 10 mg ascorbic acid (vitamin C). In general, onions are used for salads (bunching onion or sliced full-grown bulbs), pickling (e.g. silver skin onions), cooking (such as in soups) and frying (for example, with meat). Onions are particularly suited to smallholder farming in most countries. It also plays an important role in traditional medicine (e.g. as a diuretic). In the tropics onions can be grown year round where irrigation is possible. In temperate zones onion is cool-season biennial, and is tolerant to frost. They produce bulbs with growing day lengths. Optimum temperatures for plant development are between 13 and 24degC, although the range for seedling growth is narrow, between 20 and 25degC. High temperatures favour bulbing and curing. In the tropics only short day or day neutral onion varieties will form bulbs. These thrive in warm to hot climates of 15-30degC. If the temperature greatly exceeds that required for bulbing, maturity is hastened and bulbs do not grow to maximum size, consequently lowering the yields. Onions can be grown on any fertile, well-drained, non-crusting soil. The optimum pH range is 6.0 to 6.8, although alkaline soils are also suitable. Onions do not grow well in soils below pH 6.0. On light sandy soils irrigation is necessary. Irrigation could be either overhead or on drip. Onions at the bulbing stage need a substantial amount of water, but excessive moisture must be avoided during the growing season. Avoid application of fresh manure to the crop, as this will cause the plants to develop thick necks and too much leaf at the expense of bulb formation. Prior to planting, soils should be ploughed and disked sufficiently to eliminate debris and soil clods. In most commercial areas, beds 0.9 to 1.0 m wide are common, and 2 to 6 rows are seeded or planted on the bed. If two rows, they may be two-line (twin) rows with plants staggered to achieve proper spacing and high population density. Proper seed selection is recommended to minimise problems of splits and doubles. Over-fertilisation, uneven watering, and temperature fluctuations also influence bulb formation. Onion is propagated by seed (most common in the tropics) or sets (immature bulbs ripened during the previous season - in temperate zones). In the tropics the seed is usually sown in a nursery under a mulch cover. In the nursery prepare raised beds maximum 1 m wide and incorporate plenty of well-decomposed compost as well as additional rock phosphate. Make rows about 15 cm apart, sow the seeds and cover lightly with soil and mulch. Irrigate liberally for the first 10 days. Seed rate is 2-3 kg per ha. After the seed emerges, the mulch is removed. 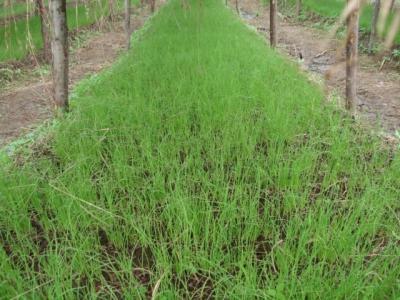 About 6-8 weeks after sowing, when the seedling has a base as thick as a pencil and is approximately 15 cm tall, the seedlings are transplanted to the field. The ultimate yield of onion is determined by the number of leaves that are formed prior to bulbing. 'Red Creole'. This is a popular standard variety in high demand because of its good keeping quality. 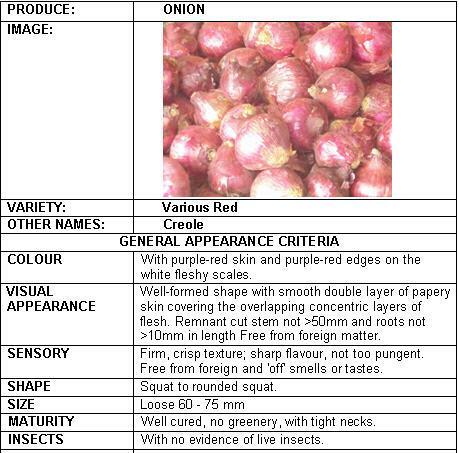 It produces mainly single onions from transplants, red, flat-round and with a pungent taste. 'Red Tropicana F1 Hybrid'. Produces large, red, thick flat onions with firm pungent flesh. It is highly productive and therefore demands high levels of management. It keeps well in dry aerated store. 'Bombay Red'. It is a variety for dry and warmer conditions. It is small to medium sized, globe shaped, purplish red and pungent. 'Yellow Granex FI Hybrid'. This is an early maturing high yielding attractive, thick flat onion with thin yellow scales. The flesh is medium firm, crisp and mild in flavor. The shape and size is uniform leading to higher market prices, and the storage quality is good. 'Texas early Grano'. This is a fresh market, early maturing variety (100 - 120 days) with a rather short shelf life. It is yellowish, mild and not very pungent. The bulbs are high top shaped with dry yellow scales. It is a heavy yielder for high altitude regions. Ideal for fish salads. 'White Creole'. This is a white variety normally used for dehydration. 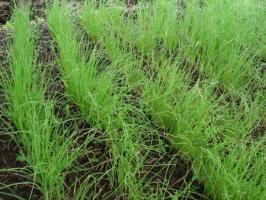 'Green bunching': Non-bulbing spring onion. It has attractive tasty dark green leaves. It is an early and highly productive onion grown for stems rather bulbs. It is tolerant to sun scotch and it is recommended for salads and fresh market. When buying seed and not recognizing the variety name as one of the above, ask if it has been grown in Africa before. If not, better stick to a known variety in order not to lose the whole production. Nursery seeding and transplanting is the most common and practical option in the tropics. Transplants normally have 3 to 5 well-formed leaves at transplant time. Roots are pruned during planting, in order not to be bent upwards when transferred to the field. This facilitates early establishment of the plant. Any germinated bulb of above mentioned varieties would produce 3-6 good size bulbs in about 3 months when planted with the rains. Choose only healthy bulbs for propagation. Sets are used in some areas in the temperate zones to ensure large bulb size and uniform maturity. Sets are small dry bulbs, approximately 12 mm in diameter, which have been produced the previous season by seeding thickly or growing under conditions that favour rapid bulbing. Direct seedling is possible and gives excellent results where herbicides can be used and the season is sufficiently long to provide early pre-bulbing growth. In the tropics this method is impractical due to enormous weeding costs in an organic system. Do not plant onions after the field has been planted with other Allium plants (e.g. garlic). Mulching onions with composted leaves and straw is highly recommended to maintain soil organic content, prevent soil-borne diseases, and suppress weeds. Planting onions in raised beds improves drainage and prevents damping-off diseases. Weeding and harvesting are mostly done by hand, although chemical weed control is possible but not organic. Crop rotation is important to avoid the build-up of pests and diseases such as nematodes, Sclerotium and Fusarium. Onions respond very well to well decomposed organic manure. Organic manure at 25 to 40t/ha is recommended to obtain high bulb yield. Harvesting takes place 90-150 days after sowing. Onions are ready for harvest when the leaves collapse. Alternatively the leaves can be bent over and left to dry for 10-12 days. The crop is pulled out by hand and kept for some days in the field with the bulbs covered by the leaves (= windrowing). The leaves are then cut off and the mature bulbs are bagged or packed in crates if they are to be stored. 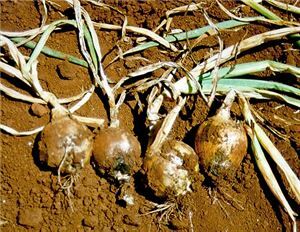 Freshly harvested onions are dormant and will not sprout for a variable period of time (this depends on the variety). Storage will extend the dormant period. Sprouting will increase in storage temperatures above 4.4degC. It will decrease again as temperatures exceed 25degC. The larvae of the onion fly, also called onion maggot is a major pest of onions. The maggot is small (about 8 mm in size when fully grown), white-cream coloured. It eats the lateral roots, then tunnels into the taproot and sometimes bores into the base of the stem. Attacked leaves wilt and the leaves turn bluish. The plants become shrivelled or eventually die. The maggots feed just above the base of seedlings killing them. A maggot can attack several seedlings in succession. This causes poor plant establishment resulting in many gaps in the field. 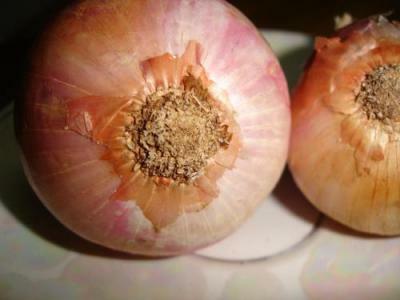 The maggots are also found inside developing onion bulbs. Their feeding exposes the plant to infection by diseases such as bacterial soft rot. Pupae are light to dark-brown in colour, and about 7 mm in length. Pupae are found in the soil near the base of the plant. 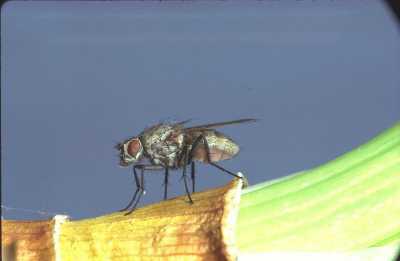 The adult is a brownish grey fly, somewhat smaller than house flies. When at rest, they keep their wings folded one over the other. Adult flies do not cause damage. They lay eggs in the soil surface near the germinating plants. Onion maggots are adapted to cool, wet weather, so usually they are less of a problem during hot dry periods. They prefer soils heavy in organic matter. 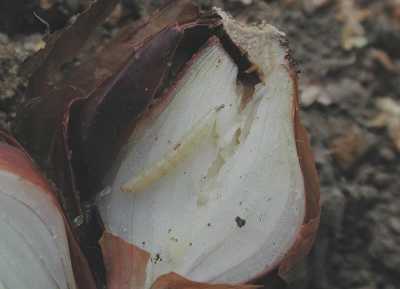 The onion maggot attacks plants related to onion such as leeks, shallots and garlic. Avoid planting in soils that are high in undecomposed organic matter, such as fields just coming out of pasture or in very weedy conditions. Flies prefer to lay eggs in soil that is moist and with high organic matter. Do not plant onions unless the plant residues are dry and completely decomposed. In soils amended with animal manures, allow adequate time for the manure to break down before planting. Avoid planting successive onion crops. Practise rotation with crops not related to onions. Keep onion fields well separated. Onions grown in the season following an attack by onions flies should be sown as far away from infested land as possible. Remove and destroy infested plants and burn them. To prevent an infestation with onion flies, carefully plough-under crop residues immediately after harvest. Turn soil to destroy pupae. Powdered hot pepper or powdered ginger placed around the stems helps when the onion fly population is moderate. Neem-based products have a deterrent effect on egg-laying. 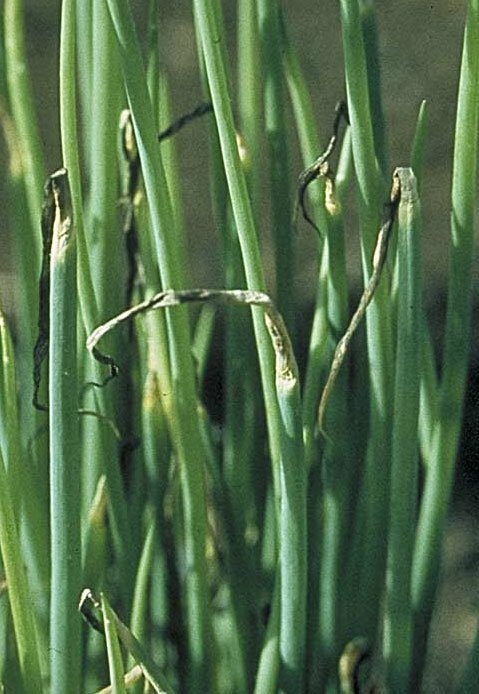 Purple blotch attacks onion, garlic, leek and other Allium crops. Initially, small white sunken spots develop on the leaves. These enlarge and under moist conditions, turn purple with a yellowish border and are often covered with a sooty deposit of spores. After 3-4 weeks the leaves turn yellow and collapse. Bulbs may also be attacked, mainly at the neck. This can be seen as a yellow to reddish watery rot. A good timing of sowing or transplanting can minimise purple blotch attack by A. porri, depending on the local environmental conditions. The fungus requires rain or persistent dew for reproduction. It can grow through a wide temperature range of 6 to 33.8 degC. Optimum temperature of fungal growth is 25 degC. Varieties with waxy foliage are generally more resistant than those with glossy leaves. Increased ploughing between seasons may reduce the disease. Increased spacing between plants also may reduce disease development. Other good practices include seed treatment, rotations, removal of crop debris and planting in well-drained soil. Under conventional production system fungicides are used when the disease is severe. In organic production systems no direct measures are allowed. Purple blotch on onion. 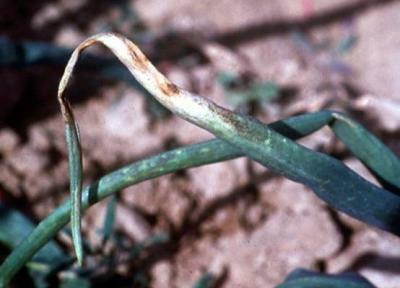 Leaf-tip dieback is a typical symptom of infection by Alternaria porri on onion and shallot. It attacks young plants, appearing as white specks, usually confined to the oldest leaves of young plants. A greyish white mould develops rapidly in cool damp weather and progresses down the sheath, and plants eventually fall over and dry up. Optimum temperatures for fungal growth are between 13 and 20 degC. Because of the temperature requirements of the fungus, the disease is more serious in higher cooler areas. The fungus survives in seeds, bulbs, sets, and on plant debris. Spores are carried long distances by air currents. The fungus can infect onion, Welsh onion, Egyptian onion, garlic, shallot, leek and possibly some other species of Allium. Use healthy seeds or sets. Rotate at least 3-years free of onions or other Allium species (e.g. garlic). Wider spacing of plants help reducing humidity and downy mildew. Preventative treatments with rock powder can reduce the attack of this disease. This is a big cause of loss in storage onions. Bacteria Erwinia carotovora subsp. carotovora) can enter the neck tissue as plants mature and then invade one or more scales. At this stage, the affected tissues are water-soaked and pale yellow to light brown. As the rot progresses, the invaded fleshy scales become soft. Diseased bulbs can be diagnosed by pressing on the bulb: a watery, foul-smelling fluid often can be squeezed from the neck of diseased bulbs. Bacterial soft rot bacteria enter only through wounds. Onion maggots (Delia antiqua) may carry the bacteria and introduce them while feeding. 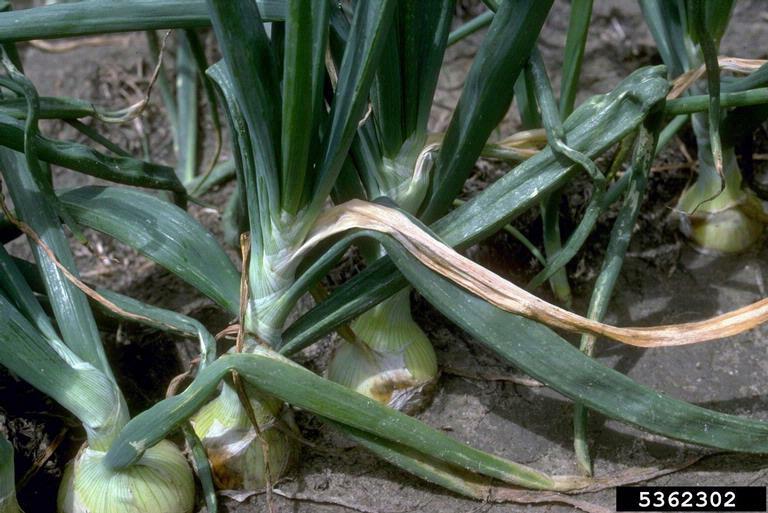 Onions with mechanical injuries, bruises or sunscald under warm, humid conditions are particularly susceptible to bacterial soft rot. 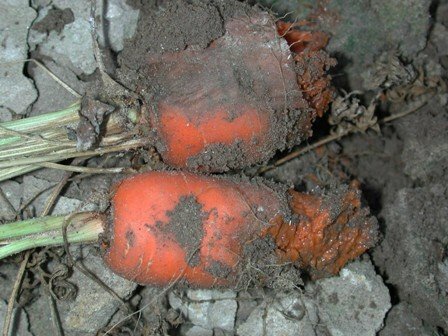 Soft rot can affect many vegetables including carrots, celery, potato and parsnip. Onion tops should be allowed to mature well before harvesting. Care should be taken to avoid bruising during harvesting and packing. Storage places should be well ventilated to avoid accumulation of moisture on the surfaces of bulbs. Onions should be stored at 0 degC and a relative humidity (RH) of 65-70%. There are no symptoms on the outer surface of bulbs during early stages of disease development. When the bulb is cut open lengthwise, one or more of the inner scales can be found water-soaked or appears as if it has been cooked. The rot does not progress crosswise in the bulb. 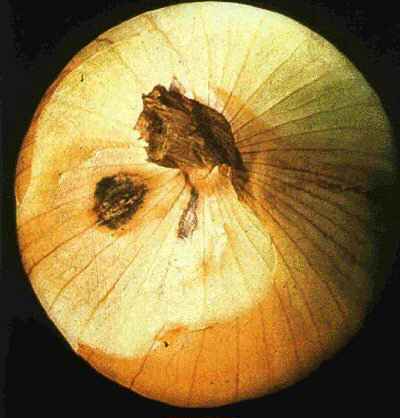 After the decay has progressed, the tissue begins to dry, the onion shrivels and secondary organisms can enter and cause a wet rot. The base of the bulb can be pressed hard enough to cause the centre core to slip out at the top, and for this reason the disease is known as slippery skin. The disease is favoured by high moisture. Proper maturing of the crop. Proper storage as in the case of bacterial soft rot. In contrast to soft rot and slippery skin, infected scales are not water-soaked but are slimy and yellow. Symptoms usually visible only after onions are dug. The upper portion of the bulb shrinks, and in advanced stages of the disease, the outer dry skin readily slips off during handling while the centre of the bulb still remains firm. Outer layer of scales often becomes darkened and almost orange. Decay of inner scales leads to a soft rot that has a sour, vinegar-like odour. 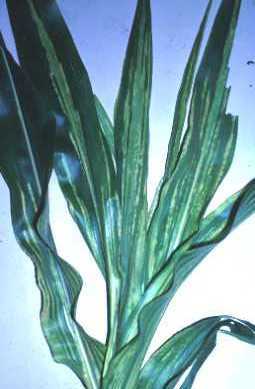 The disease is favoured by wet warm conditions. Management measures for the disease are the same as for slippery skin. It usually appears in fields just before harvest and continues to develop during storage period. Under warm and wet soil conditions, it can cause seedling damping-off. The most common symptom is the small dark green or black stains (dots) on outer scales of bulbs. The dots develop concentric rings. In severe cases, the fungus attacks the living tissue causing a collapse of fleshy scales. On coloured onions, the fungus is restricted to the neck of the bulbs making the flattened leaves colourless. The fungus survives on onions, sets and in the soil. Warm moist conditions favour development of the disease. Optimum temperature for infection is from 23.9 to 29.4 degC. 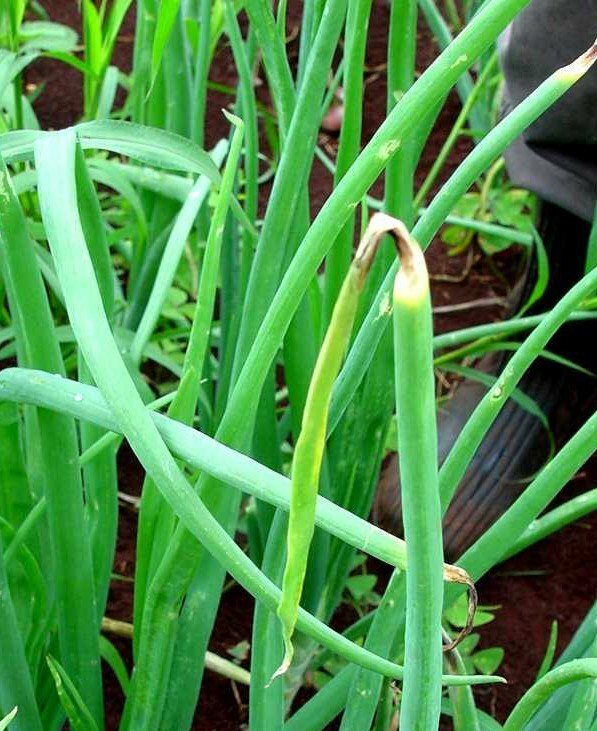 White onions are very susceptible to the disease. Reduced market value results from marred bulb appearance and bulb shrinkage. It also attacks leeks and shallots. Disease management involves growing coloured varieties where smudge is a persistent problem. Avoiding exposure to rain between harvest time and storage. The disease occurs mainly in the field and seldom causes injury in storage. The disease is called white rot because of characteristic basal bulb rot where the tissue is covered with white mat of fungal growth. Later numerous rounded black fungal bodies (sclerotia), each about the size of a pin's head, develop. The leaves of diseased plants decay at the base, turn yellow, wilt, fall over and die. The older leaves are the first to die. The roots of affected plants are usually rotted making the plants easy to pull. 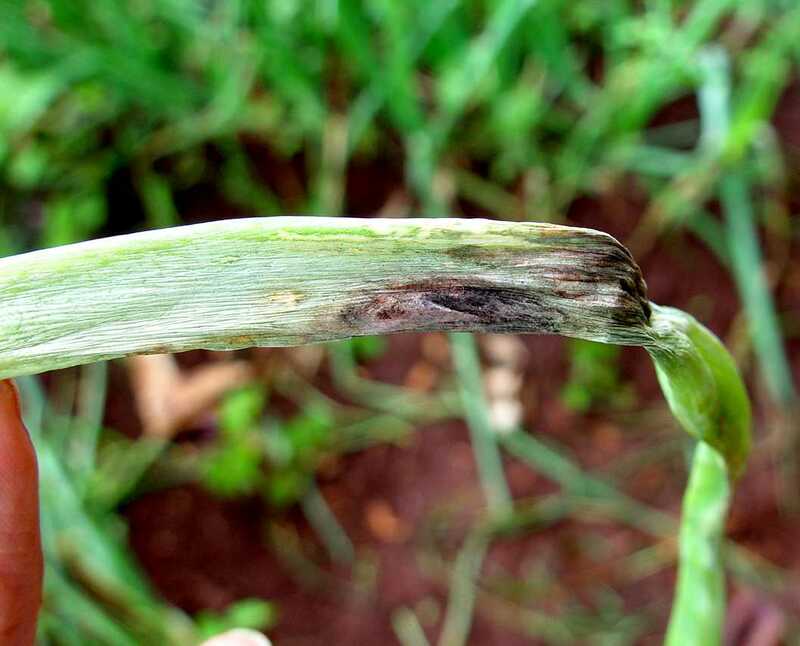 Optimum temperature range for infection is from 15 to 18.3deg C. The fungus survives in the soil as sclerotia and also in diseased onion sets and wild onion. It is most severe in light cool moist soils. Its host range includes Welsh onion, garlic, leek, shallot and some species of wild onion. Plant tolerant, resistant varieties, if available. Practises long rotation (8-10 years) with cereals. Destroy wild onions and leeks. Manure from animals fed on diseased plant material should not be used on onion fields. Symptoms of white bulb rot. Infected onion bulbs displaying sclerotia (black) and hyphae (white) on the base. 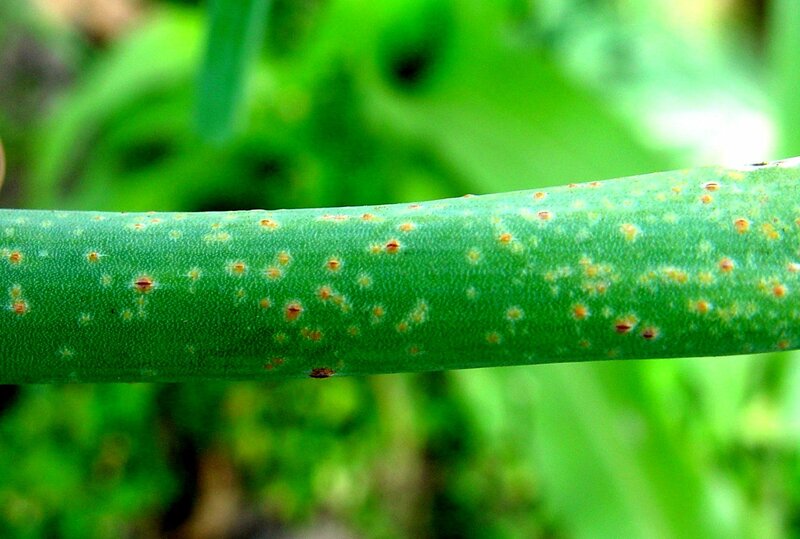 Affected leaves show small reddish to dusty orange spots (pustules). These later turn black and are covered until maturity by leaf epidermis. Leaves that are heavily infected turn yellow and die prematurely. A new crop of leaves may develop and the bulb size is usually reduced. The fungus attacks also leek, shallot and some wild species of Allium. The disease is favoured by high humidity coupled with moderate to low temperatures. Also excessive nitrogen in the soil favours disease development. Disease management involves rotation, and removal of weed hosts. 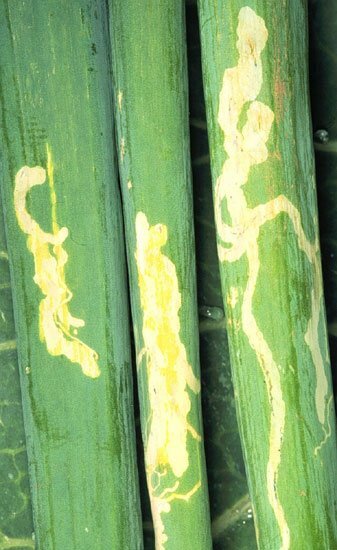 The above ground symptoms constitute yellowing of leaf blades at the tip. The yellowing at later stages covers the whole blade. The affected leaves shrivel and decay. Diseased plants can be easily pulled out because the root system is rotted. Affected roots are dark brown, flattened, hollow and transparent. When diseased bulbs are cut vertically, a brown discolouration is evident. The fungus survives in any soil moisture that permits crop growth. 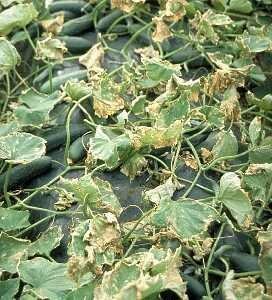 Infection is facilitated by injuries to root system, Losses can occur in the field and in storage. 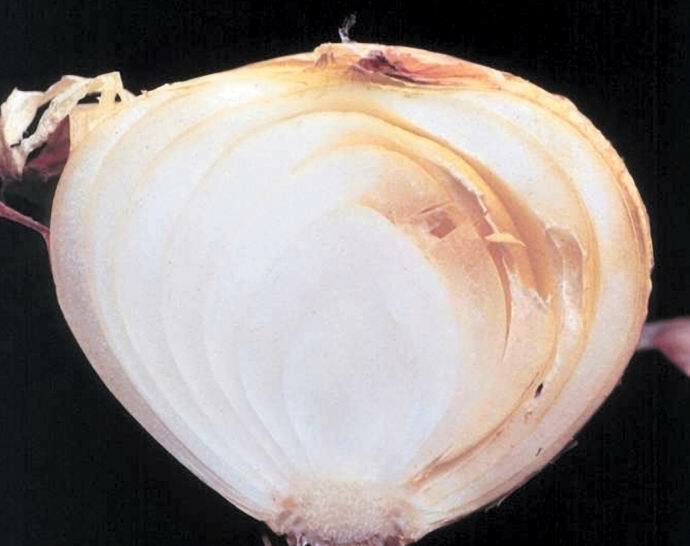 The disease is most prevalent where onions are grown under high temperature conditions. 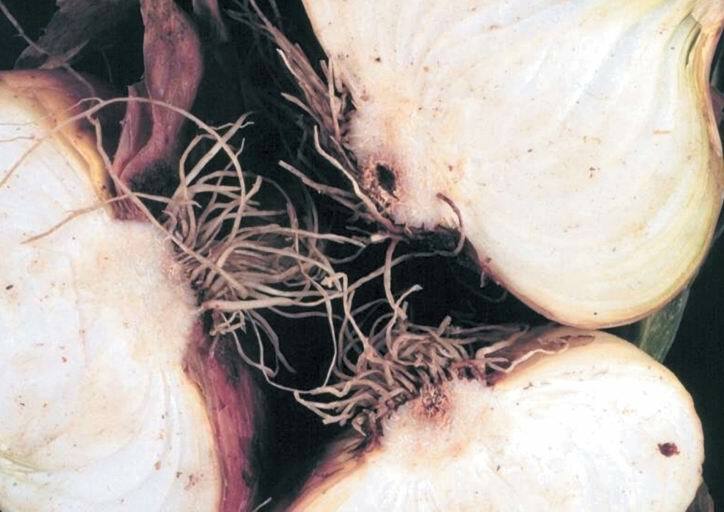 Although of no economic importance the disease could attack garlic, shallots, chives and leeks. It also can survive in weed, Oxalis corniculata. Proper cure the bulbs before storage. Store the bulbs at 0degC / 65-75% relative humidity is recommended. AIC, Ministry of Agriculture and Livestock (2003). Fruits and Vegetables Technical handbook. Beije, C.M., Kanyagia, S.T., Muriuki, S.J.N., Otieno, E.A., Seif, A.A., Whittle, A.M. (1984). Horticultural Crops Protection Handbook. KEN/75/028 and KEN/80/017. National Horticultural Research Station, Thika, Kenya. Bohlen, E. (1973). Crop pests in Tanzania and their control. Federal Agency for Economic Cooperation (BFE), Germany. ISBN: 3-498-64826-9. Foster, R., Flood, B. (Eds) (1995). Vegetable Insect Management with emphasis on the Midwest. Purdue Research Foundation. ISBN: 0-931682-52-5. Schmutterer, H. (1995). Effects on Viruses and Organisms. Thysanoptera: Thrips. In: The neem tree Azadirachta indica A. Juss. and other meliaceous plants sources of unique natural products for integrated pest management, industry and other purposes. (1995). Edited by H. Schmutterer in collaboration with K. R. S. Ascher, M. B. Isman, M. Jacobson, C. M. Ketkar, W. Kraus, H. Rembolt, and R.C. Saxena. Pages VCH. Pages 251-254. ISBN: 3-527-30054-6. Shanmugasundaram, S. (2001). Suggested cultural practices for onion. Edited by T. Kalb. AVRDC Training guide, AVRDC. Sherf, A.F., Macnab, A.A. (1986). Vegetable Diseases and Their Control. 2nd. Edition. John Wiley & Sons Inc. ISBN: 0-471-05860-2. Youdeowei, A. (2002). Integrated pest management practices for the production of vegetables. GTZ. Integrated Pest Management Extension Guide 4. Published by The Ministry of Food and Agriculture (MOFA) Plant Protection and Regulatory Services Directorate (PPRSD), Ghana with the German Development Cooperation (GTZ). ISBN: 9988-0-1088-5.